Our Environment is everything around us and we share an intimate relationship with it starting from our very first day in this world. We, humans, live in this environment but spend little time in thinking and caring about it. This ignorance and inaction on our part is a huge concern because rapid increase in population, unplanned development and other human activities are putting a lot of pressure on the environment today. At this point in time, youth can play an important role in protecting the environment. The young population has more responsibility when it comes to environmental protection. This is because youth is the generation who can easily adopt new ways to save the environment. It is also the generation which will be the most impacted if nothing is done to protect the rapidly degrading environment. It is the young people of today who will ultimately be living with the result of decisions we take today, or not take today, for protecting the environment. Our common environment is on the verge of destruction and this is no longer just a speculation. Time to act is NOW. If you are still unsure and think it can wait, here are seven reasons why the Youth needs to act today to protect the environment. All the infrastructure and development in all the fields that we are doing can be destroyed in seconds by the wrath of Nature. It therefore becomes very important that we learn to live with and in harmony with Nature as attempts to defy and conquer Nature in the past have led to some very disastrous consequences. We currently see that there is an increase in the number of flash floods, earthquakes, droughts etc. most of which are happening due to disturbances caused by human activities. We need to think and act and make Environmental Planning an integral part of every infrastructure-building and developmental activity in order to save ourselves from disaster. Our environment is full of beautiful things. From breathtaking scenic beauty to astonishing natural structures, Nature is full of aesthetics. The beauty of Nature calms our mind. It gives us ideas to recreate and enjoy. Nature is a system where uncountable components are placed perfectly. Several boring months of our mundane jobs benefit immensely from a week long trip to a mountain, beach or a forest inside a National Park. But imagine if the mountain ecosystem is destroyed, beaches are polluted and National Parkas are encroached and the wildlife poached. There will be no aesthetics left to rejuvenate our lives. It is therefore our duty and in our interest to save the aesthetics of Environment for centuries to come. We are nurtured by our Environment and without this perfectly balanced system, we will no be able to live on this Planet even for a single minute. The air, water, land, plants and animals around us all keep us alive and it is therefore our moral obligation to save the Environment. We need to return something for all that we receive from our environment. At the same time, we have already done a lot of damage to the environment because of our short-sighted development. This is killing the other animals and plants with whom we share our planet. It therefore also becomes our ethical responsibility to save the habitat of the plants and animals and to make up for the damages that we have done. The environment protects us so we need to protect the environment. Simple! We, along with other living organisms, are a part of a food chain and hence a food web. Extinction or decrease in the population of any species can cause imbalance in this system. Such imbalance can cause the whole food chain to collapse. This will disturb life on Earth and will threaten our own survival. What it will also do is that it will reduce the diversity of food that is available to us. Reduction in food diversity will not only make our meals more boring and mundane, it will also keep up devoid of important nutrients we receive from the diverse food that we eat. It will then mean eating tablets and medicines in order to meet our daily nutritional requirement. Hence, we should protect our environment if we want to protect tour food and food choices. Our Environment has many bio-resources which are used in various cultural practices that are followed in the world and most notably in India. The cultural practices and rituals in India are inherently linked to biodiversity and one cannot imagine these rituals to be performed without using natural resources such as chandan, haldi, tulsi, herbs and even animals like the mighty elephant! The desecration of Nature and environment is also, in a way, disrespecting our cultural practices and value system. Destruction of the environment is therefore directly linked with losing our cultural values. This is yet another reason why the youth needs to work to protect the environment lest it will inherit a future which lacks these precious systems of peaceful societal functioning. The resources available on the Planet are limited. Furthermore, resources are distributed unequally and destruction or reckless use of these resources will have (as it is having) negative impact on the society. Overuse of resources can lead to exhaustion. The resources which are non-renewable generally take thousands of years to replenish. For the sake if inclusive development and sustainable growth, it is important that we do not waste natural resources and protect them in every way that we can. These natural resources need to be protected for all humankind today. Protecting the environment will not only help current generation but future generations also. It is our duty to take care of and protect our environment for future generations. With limited resources and interconnected components, it is very important to act towards protecting our environment. Everything in the environment is interconnected. If we do not protect it then the disturbance can threaten our existence. Protecting the environment is necessary for sustaining life on earth. Remember, we only borrow the Planet from our future generations. 8. 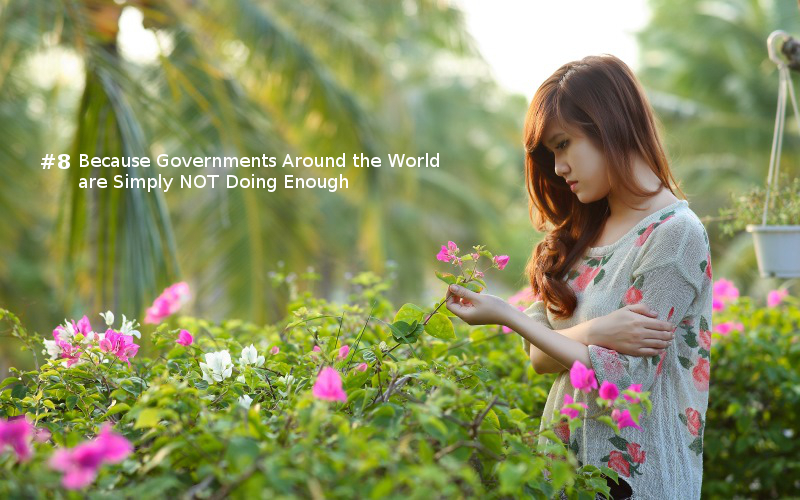 Because Governments around the world are in Business As Usual mode and are simply NOT doing enough to save and secure our Future. This article marks the UN International Youth Day which is celebrated on 12 August since the year 2000 to draw attention to cultural and legal issues surrounding youth.